Tar and asphalt are all harmful to your car and usually very difficult to remove. Gyeon Tar makes an easy job of safely dissolving these contaminates and light work of removing organic matter also, such as tree sap and other environmental pollution. 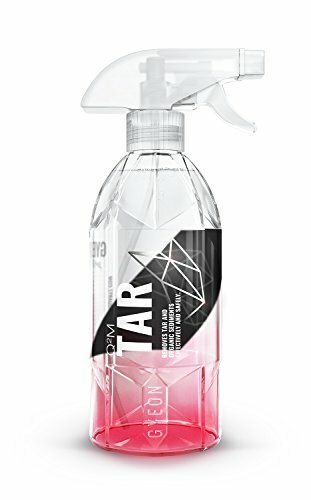 HOW TO USE: wash the entire car with a high quality car shampoo, rinse well and spray Q2m Tar generously, wait 2-4 minutes for tar to take effect and wash away or wipe with a damp Microfiber cloth until the surface remains perfectly smooth. Avoid application in direct sunlight. CarPro Tar X is a glow-in-the-dark bug and tar remover made of natural solvents extracted from orange peels. Tar X safely lifts grease, tar, asphalt, insects, tire marks, adhesives, traffic film. and any other stubborn contaminants. There are no harsh chemical solvents and nothing to harm your vehicle. 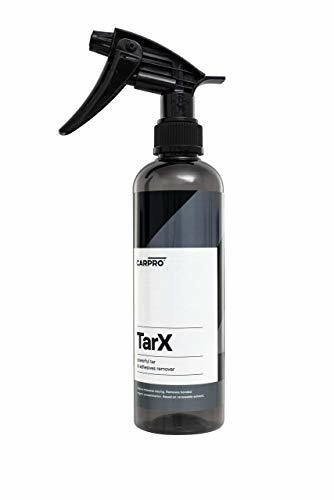 CarPro Tar X is safe, simple to use, and it works! 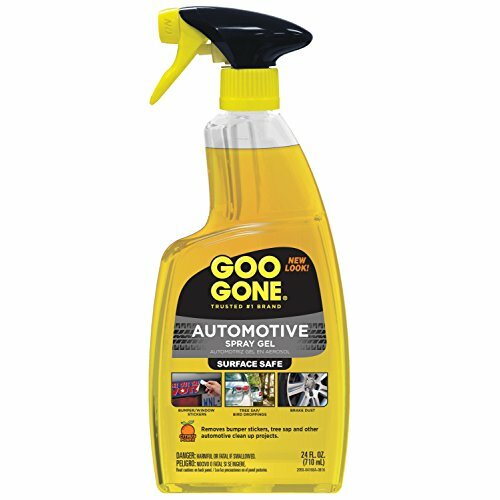 No-drip and surface-safe, Goo Gone Automotive Spray Gel is the easy way to keep your car looking cherry. Perfect for cleaning bumpers, dashboards and auto upholstery. Bug carcasses are really difficult to remove and their exoskeleton can scratch your paint and trim surfaces. 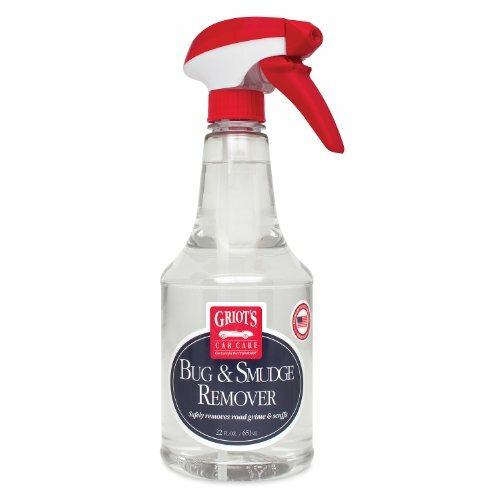 Bug and Smudge Remover softens that bug jerky for safe, quick, and easy removal. Pre-treat bugged up surfaces before you wash with this cleaner by spraying and letting it penetrate for several minutes before washing your vehicles. This new cleaner does more. It also removes heavy oils, smudges, gunk, heavy road grime, and scuffs. You can quickly remove rubber marks from paint and trim after a day on the race track. Just spray, allow the surfactants to penetrate, then gently wipe with a soft, clean micro fiber cloth. Safe on all exterior surfaces. Large, 35 ounce bottle. Does not include Finest Sprayer. Citrol Concentrate is a concentrated heavy-duty, water dilultable, emulsifiable, industrial strength, biodegradable, citrus base cleaner and degreaser. Citrol Concentrate is designed for use in almost any industrial, transportation or general plant maintenance cleaning and degreasing operation. Citrol Concentrate is an excellent replacement for hazardous aliphatic, aromatic, chlorinated, fluorocarbon, alkaline, acidic or petroleum solvent base cleaners and degreasers. Citrol Concentrate is specially formulated from a combination of organic citrus based solvents and a multi-component surfactant-emulsifier system. This unique combination provides Citrol Concentrate with the ability to rapidly penetrate and remove a wide range of different soils, dirt and inks. Citrol Concentrate’s formulation does not contain any unacceptable petroleum distillates, petroleum hydrocarbons, chlorinated or chlorofluorocarbon type solvents. 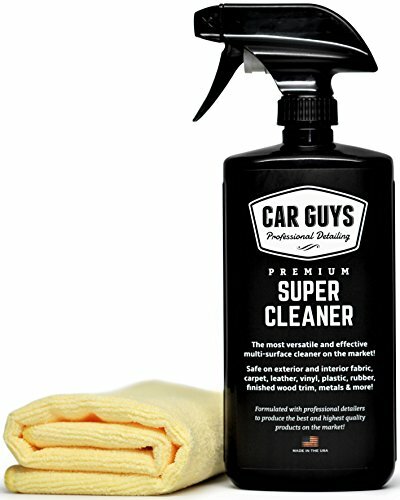 Chemical Guys "Strong Wash Bug, Tar and Grime Remover" cleans even the dirtiest cars that are obliterated by bugs, bird droppings, splatter, airplane fallout, tree sap, tar and general "gunk". Formulated as a pre-wash concentrate to remove dried, squashed bugs from windshields, grilles, hoods, bumpers and headlights without harming your paint. Because of their tough exoskeletons and corrosive body fluids, bugs form a bond with your paint which means after washing, marks are still left behind. The last thing you want to do is use a rough brush or mitts to remove them, as this only induces more damage. Strong Wash will remove these bugs with ease along with other nasty fluids, oil and tar spots. Rust-Oleum Wax and Tar Remover is an effective, fast-acting remover for many automotive surfaces, including metal, plastic and fiberglass. Removes old wax build-up before re-application of new wax . 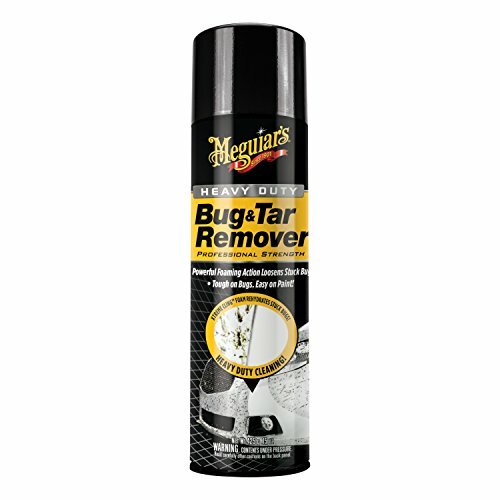 Meguiar’s Bug & Tar Remover has specialized surfactants that effectively remove bugs and tar from your paint finish. 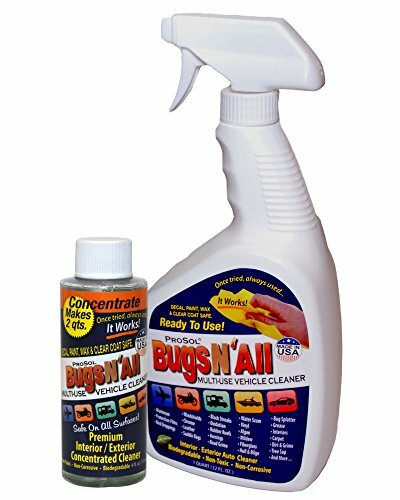 This car bug cleaner features our long-lasting Xtreme Cling foam, which extends the active foam time to rehydrate bugs and soften tar for easier removal. Our professional-strength clear coat safe technology is tough on bugs but easy on paint and all exterior surfaces. Use bug cleaner before washing or alone as needed. Turtle Wax Bug and Tar Remover is an innovative product formulation that removes bugs, tar, tree sap, and road grime from your car's finish and restores a deep gloss shine. Oil Slick is a handmade formula designed to efficiently and effectively remove the beach tar off skin, shoes, sandals, and even surfboards! Oil Slick is completely nontoxic, eco-friendly, smells great and is made locally in the Santa Barbara area. Available in a 4oz spray bottle or very convenient individual towelettes. The problem with beach tar is not that it gets on your shoes and feet and ruins your surfboards, but we see countless people using petroleum based products on the beach to remove the tar such as gasoline, lighter fluid, WD40, and baby oil. Believe it or not these are all petroleum based products. Oil Slick was created to provide a more eco-friendly and safer alternative to using these harsh chemicals on our skin and beach gear and for the sake of our beautiful beaches. Oil Slick Beach Tar Remover is a blend of medium chain triglycerides mixed with a nontoxic citrus solvent. We use high grade and expensive ingredients to make sure we deliver a working product. A 4 ounce bottle puts out approximately 800 sprays and it only takes a little more than a few sprays to take the tar off your feet. Your vehicle is constantly subjected to bugs, tar and other road grime that are unsightly and tough to remove. Armor All Extreme Bug & Tar Remover is specially formulated to effectively remove these soils while maintaining wax protection. Streak-free formula can be used directly on soils for spot cleaning, or used as a pre-treatment prior to washing. 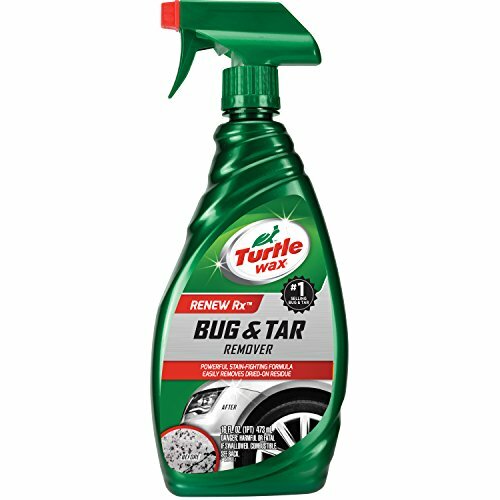 The Turtle Wax Bug and Tar Remover removes tree sap and other sticky substances from any surface. Rust-Oleum Wax and Tar Remover is an effective, fast-acting remover for many automotive surfaces, including metal, plastic and fiberglass. Removes old wax build-up before reapplication of new wax to promote an even, mirror-like finish. It is also great for removing grease, silicone and road film. CarPro TRIX Tar and Iron Remover combines two paint decontamination steps into one, saving you time and money! This product is designed specifically for pro detailers to prepare vehicles for detailing using less time, materials, and lhor. CarPro TRIX is a strong degreaser, cleaner, tar remover and iron remover for virtually any exterior automotive surface. Your vehicle is constantly subjected to bugs, tar and other road grime that are unsightly and tough to remove. Armor All Extreme Bug & Tar Remover Wipes are specially formulated to effectively remove these soils while maintaining wax protection. Keep your car looking spotless with the ArmorAll Bug Spray Remover. Whether you're taking a long trip or concerned with the normal swarm of insects that comes with the warmer months, ArmorAll's non-greasy formula works hard to keep your car looking great. 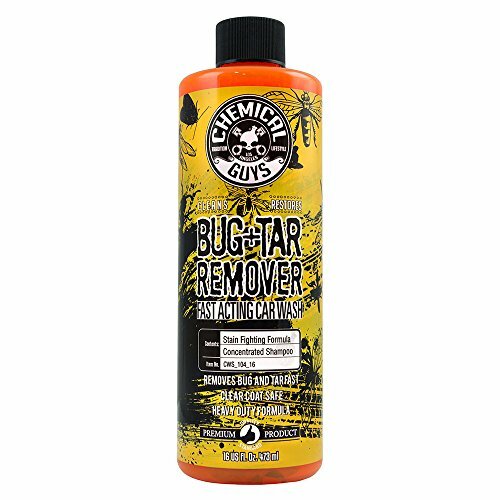 Formula 1 Bug & Tar Remover, quickly removes bugs, tar and tree sap from all exterior services. Powerful solvents penetrate and clean the toughest stains. Gives paint a deep shine! Unbelieveable Citrus Gel Grease, Adhesive & Tar Remover. Specialized surfactants rehydrate and loosen stuck bugs, and softens tar making removal a breeze! Use before regular washing, or alone as needed! Pack of 3 - Stoner Car Care Tarminator Bug, Tar, Sap, and Grease Remover - 10 ozTarminator breaks down the complex molecules found in tar and other sticky materialsThis unique MicroActive cleaning technology gives Tarminator unequaled ability to remove even baked-on tar, grease, sap, and asphaltPack of 3 - Stoner Car Care Tarminator Bug, Tar, Sap, and Grease Remover - 10 oz. 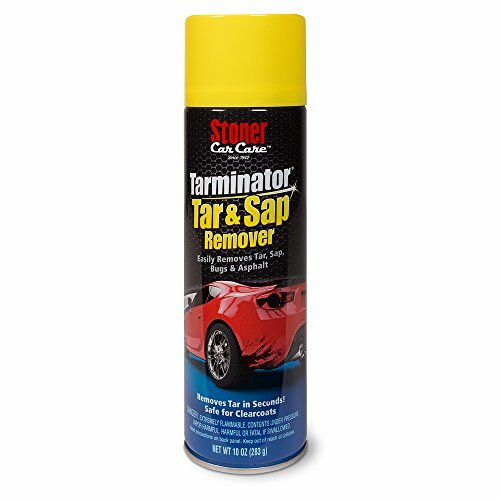 Tarminator is the fastest and easiest way to remove difficult road grime. Best of all, it's specially formulated to clean quickly without harming paint, clearcoats, and other finishes. Simply spray it on, and wipe surfaces clean. Black Jack, 23 OZ, Asphalt & Tar Remover, Instantly Removes All Types Of Asphalt & Tar Coatings & Patches From Clothing, Skin, Tools & Virtually All Other Surfaces, 100% Organic & Biodegradable, Gentle On Skin, Biodegradable In 8 Days, Spray Bottle. SKU: NA-TGR Water-based formula Effective, fast acting to remove tar andtrim mark Safe to use on many automotive surfaces User friendly citrus fragranceNANOSKIN TAR SOLVENT All Purpose Tar & Grease Remover is water-based and is an effective, fast-acting remover for many automotive surfaces, including metal, plastic and fiberglass. Removes adhesives, labels, grease, tar, motor o.i.l, sap, crayon, candle wax and o.i.l-based foods from carpet, fabric, vinyl and virtually any hard surface. Great for removing grease,and road filmDilutions:Heavy Duty Cleansing RTUGeneral Purpose Cleansing 1:1DIRECTIONS:Test surface compatibility on an inconspicuous area before using. Lightly moisten a clean cloth.Lightly rub surface to remove undesirable .Not recommended for freshly ed surfaces.Do not use on plastic. WARNING: This product can expose you to Toluene which is known to the State of California to cause birth defects and reproductive harm. For more information, go to www.P65Warnings.ca.gov.